Following months of near-perfect growing conditions, a heat wave in mid-September brought about a rapid pace to finish Sonoma County’s winegrape harvest with most varieties reaching the optimal flavor and ripening levels in the fruit. About 90 percent of the county’s winegrapes have already been picked and late ripening fruit varieties such as cabernet sauvignon, syrah and merlot should be picked by mid-October – nearly two weeks earlier than normal. Thanks to generous rains early in the year, a warm spring and a mostly mild summer, what was once thought to be a short crop grew into an average-size vintage which was welcomed following last year’s short harvest. Unique to this year’s harvest was when a particular variety ripened, it seemingly ripened everywhere throughout Sonoma County with cooler region vineyards ripening at the same time as those in warmer climates. The recent rainfall also had little impact on the grapes as most fruit is already off the vines and it was a mild storm – just enough to dust off the grapes. 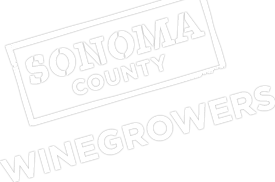 Throughout Dry Creek Valley, it appears everyone is right on track for an average crop size. The quality and flavors of sauvignon blanc have been cited as being terrific and the same is true with Zinfandel. Cabernet quality seems outstanding. Harvest in Dry Creek Valley should be completed by the third week of October.